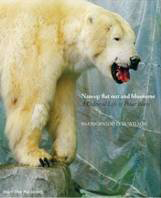 The Polar Bear – nanoq in Inuktitut – is perhaps the most popular large carnivore on the planet, its singular blend of fuzziness and ferocity compelling to children and adults alike. The vast majority of us, happily, have seen this great animal only in zoos and museums; an encounter in the wild is something we are glad to have done without. With its enormous range of movement, and that paw which – as zoo docents never tire of reminding us – could rip our heads off with one casual thwack, there is also probably no animal more uncanny in the stillness of its taxidermied state, and it is this class of specimens, and their curious place in our material culture, that Snæbjornsdottir and Wilson document in this remarkable book. They began with a photographic inventory of all the major stuffed specimens of Ursus Maritimus in the UK, whether in private homes, snarling above the taps at a local pub, or proudly displayed at national museums. Despite the imposing nature of such a task, it might well have been a banal exercise, but for two things: 1) their conscious decision to photograph all the bears in situ, even when (as was surprisingly common) they’d been placed in storage or cast aside in a back room; and 2) the almost obsessive care with which the context and material culture of these bears was catalogued with them. The result is a volume which is, by turns, strikingly beautiful, tawdry, sublime, disturbing, and enlightening. One of the book’s very first images, that of a bearskin mounted only on a sawhorse-like wooden armature at Blair Atholl Castle in Perthsire, manages to be all of the above at once. The fur, darkened no doubt by centuries of pipe-puffing Dukes and their wax tapers, is nearly black; mounted without glass eyes but with its teeth still clinging to mummified gums, it lurks in a corner by the stairs, waiting to give the unwary tourist nightmares. Such visions make one yearn for the subtle vivacity conferred by the taxidermist’s art, although even then – as with a half-bear mounted as if about to pounce on a seal at Fyvie Castle, not everything is as complete as might be wished. All this would make for a book of enormous interest, and yet there is more. A small selection of thought-provoking essays – the best of which is Michelle Henning’s “Skins of the Real: Taxidermy and Photography” – adds scholarly panache. This surprising and captivating volume is almost impossible to classify – but no matter. It will appeal to any reader who has ever found their consciousness haunted by images of these immaculately mobile animals, whose kinetic energy persists even long after their forms have been stilled.